The headline just emailed to me says: “ABC News Poll: Banks Need to Make Amends.” And it’s true: 77% of respondents think banks need to do more. Sounds like people are still pissed! But if you click on the poll, you also get the result on the right. Unfortunately, that doesn’t look much like an angry mob to me. Basically, the country is evenly split on whether the bank bailout was fair, and a majority thinks banks treat people decently. I’m pretty surprised by that. 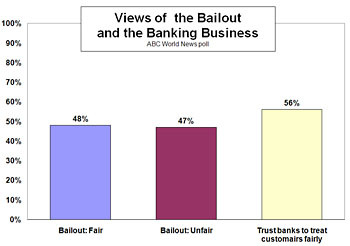 Judging from news coverage, I would have expected about 80% of the country to loathe the bank bailouts, and after nonstop coverage of credit card and debit card excesses, I’d expect trust in banks to be somewhere around the same level as lawyers and late-night pitchmen. But no. Overall, this reaction is a great big “eh.” It doesn’t bode well for the prospect of public pressure pushing Congress to do anything serious about financial reform.